The Thunder came out of the gates on fire, dropping 40 points in the first quarter. Steven Adams led Oklahoma City with 14 points, and Russell Westbrook recorded 6 assists. DeMar DeRozan and Kyle Lowry combined for 13 points in the quarter. Toronto trailed 34-40 after one. Toronto had control of the 2nd quarter, especially on the offensive end. The Raptors scored 30 points in the quarter led by DeRozan's 6 assists. Delon Wright and Lucas Nogueria combined for 10. With 6:24 remaining in the half, Nogueria drove past Raymond Felton and threw down a thunderous dunk. Bebe was fouled on the dunk, and he made the free throw. The Raptors trailed by 2 points as the score was 64-66. DeRozan was a offensive beast for the Raptors in the 3rd period. Deebo dropped 10 points, while Lowry and C.J. Miles combined for 10. 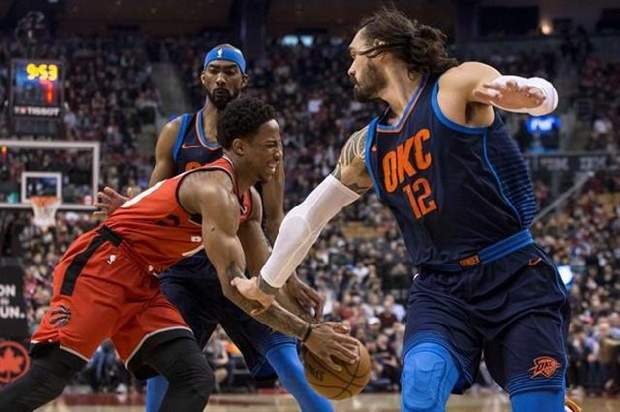 At the 2:18 mark in the quarter, Oklahoma City's Paul George performed a hesitation crossover that shook DeRozan, allowing George to get a easy dunk. The Raptors forced 5 turnovers in the quarter, but it seemed that they gave the ball right back after each one. Toronto led 98-97 going into the final period of play. Westbrook was absolutely unstoppable in the 4th quarter. The reigning MVP had 15 points and 4 rebounds in the frame. With 9:33 remaining in the game, Miles drove along the baseline and posterized former Raptor, Patrick Patterson. This play was the only bright spot for Toronto in the quarter. After some questionable calls by the Refs later in the game, DeRozan, Serge Ibaka, and head coach Dwane Casey were all ejected from the contest. Toronto struggled all night to grab rebounds, which ultimately caused their loss. Lowry had more rebounds than Jonas Valanciunas, which goes to show their struggles. The Raptors we're defeated by the Thunder 125-132, snapping Toronto's 11 game win streak.